The Legend continues with Legend FC 7. Set to go down on February 11, Legend FC has put together a stacked ticket for their seventh installment. The top of the card includes an inaugural welterweight title bout between Korean standout Myung Ho Bae and China Top Team member Jingliang Li. Bae has gone unbeaten in his four-bout LFC career while Li has also won his last four LFC outings. Meanwhile, the co-main event pits two of China's top bantamweights for the LFC Bantamweight Title. 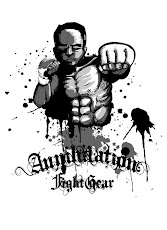 Rising undefeated prospect Jumabieke Tuerxun (10-0) will make his Legend debut when he challenges current LFC Bantamweight Champion Yao Honggang for the title. In other bantamweight news, former Sengoku contender Taiyo Nakahara will also make his Legend debut. The Japanese Team Wajutsu Keishukai representative, is slated to face tough Aussie fighter Michael Mortimer, who returns to LFC following a submission victory over Ereneo Galindez at LFC 6. Legend returns to Macau for its first event of 2012 when City of Dreams exclusively presents Legend Fighting Championship 7 on Saturday, February 11!South Korea’s Bae Myung Ho returns to the Legend Ring for the first time since claiming the Legend Welterweight Title in July 2011. He puts both the belt and his undefeated record at Legend on the line against China’s top welterweight Li Jingliang. 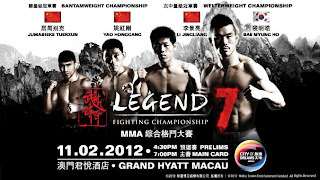 China Top Team standout Li is riding a three-fight win streak against some of Legend’s top welterweight contenders, including two highlight reel finishes and a Submission of the Night award.In the co-main event of the evening, Li’s teammate Yao Honggang will be making his own first defense of the Legend Bantamweight Title. The Shuaijiao master will be facing a dangerous but familiar competitor: compatriot Jumabieke Tuerxun. Bieke is one of the only men to ever defeat Yao in competition – a loss that Yao will be seeking to avenge in dramatic fashion.South Korea’s Choi Yeong Gwang returns to action from an injury that has kept him sidelined for almost six months. Seeking to re-establish himself as a title contender, he faces the man who replaced him in the Legend Featherweight Tournament: Filipino fighter Mark Striegl. And Striegl’s Japanese teammate Koji Ando looks to bounce back from a controversial decision loss when he takes on South Korean “Tornado” Song Un Sik.Also appearing on the card will be Legend veterans Matt Cain (Australia), Liu Wenbo (China), Michael Mortimer (Australia), Wang Sai (China), and Yang Hae Jun (South Korea).